Golf is a Life-Changing Experience! In 2002, Mark and his wife, Karen, were looking for a place to attend church. He grew up in a Jewish family and she had grown up Catholic. They heard about BridgeWay Community Church and decided to check it out. While there, Mark, still a seeker, heard about the Keynote Golf Challenge and Karen encouraged him to sign up. Mark ended up being paired for the day with Craig Parker, the pastor at BridgeWay. Even though their golfing skills were worlds apart, they ended up having a great time and Craig asked Mark a lot of questions about his spiritual journey. As Mark was packing up things at the end of the day and walking to his car, the prize he received (a ceramic plate with the words, “You Are Loved” and “We Thank Our God Through Jesus Christ for You” – Romans 1:8 painted on it) fell out of the box. Mark watched as the plate hit the pavement and bounced but didn’t break. It was a reminder to him that God did love him and had given His only Son to die for him. Not long after, Mark gave his life to Christ, got involved at the church and has played in the Keynote Golf Challenge every year since, raising more than $30,000! Over the last 14 years, more than $1,500,000 has been raised through the Keynote Golf Challenge crazy events! As a result, Keynote has continued to offer innovative tools for outreach and training in communication around the globe! The Keynote Golf Challenge is more than just raising money and playing a lot of golf! 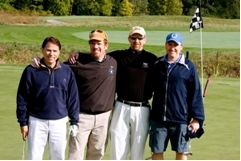 As you can see from Mark’s story, even the golfers can have a life-changing experience! The Golf Challenges in May (California on May 10 and Indiana on May 24) have been one of the biggest ways God provides Keynote with the resources we need to serve as a ministry. This enables us to do concerts for free, turn the lights on at the office, buy needed equipment, etc. As you see, God has provided through many people using their talents (or even lack of talent – there’s a prize for the worst golfer, too) and their willingness to find sponsors to make Keynote’s ministry possible. If you find yourself interested in ministering in a fun and crazy way, check out www.keynote.org/golf and see what it’s like. And we would love for all of you to pray for those involved in the challenge, the organizers, volunteers, and sponsors. The recent recession has affected so many of our generous supporters that it’s more important than ever for us to see God provide the resources needed. On a personal note, we had a great time over spring break being involved in our dear friend’s wedding. Anja was a great flower girl, too. Since we’ve gotten back, it’s been non-stop doctors’ appointments for me (they multiply!). I would love for the doctors to have wisdom in sorting out what’s up with me and success in treating it. Karl, as ever, is wonderful and I’m blessed to celebrate 12 years with him as my husband this month! God is good! Thank you all for your care for us and your part in our ministry! This entry was posted in Prayer Letters on May 7, 2010 by Liesl.